(Nanowerk News) There are videos on the internet that can make one marvel at technology. For example, a smartphone is casually bent around the arm or a thin-film display is rolled in all directions and with almost every diameter. From the user's point of view, this looks fantastic. From a professional point of view, however, the question arises: Is that already possible? At Display Week 2018, scientists from the Fraunhofer Institute for Applied Polymer Research IAP will be demonstrating today’s technological possibilities and their next projects. Display Week is one of the world's leading display technology fairs and conventions, taking place from May 22 to 25 in Los Angeles. How does a display become flexible? A prerequisite for a display to be pliant is the flexible base: full flexibility is achieved using a foil. Curved displays use flexible glass material. However, on the path of transformation from flexible substrate to the finished display, there are various steps for the researchers to take. One step is the development of a light source that is also thin and flexible. The integration of self- illuminating pixels that can emit light, for example, by electrical stimulation, makes this possible. Organic light-emitting diodes, OLEDs for short, use such organic light emitters. A proven technology for displays based on organic light emitting diodes is the active matrix OLED technology, short AMOLED. Each pixel has its own power supply. A backlight is therefore not necessary. The display will be even thinner and more flexible. 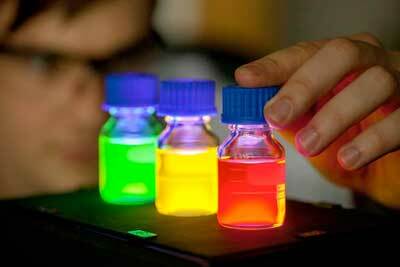 Quantum dots (QD) are also a suitable material for self-luminous displays. Quantum dot LEDs, QD-LEDs for short, combine the advantages of organic light-emitting diodes with the outstanding luminous properties of the quantum dots. The emission spectra are very narrow band. As a result, the colors look extremely bright. In addition, the low cost manufacturing makes QD-LEDs very attractive for the display market. So far, existing cadmium-based quantum dots are not future-proof, since the use of cadmium in display production is only possible to a very limited extent from 2020 on, according to the RoHS directive. Nevertheless, market researchers see great potential for the display industry in QD technology. Compared to OLEDs, QD-LEDs not only have a larger color gamut, they are also brighter. The Fraunhofer researchers present their promising results on the synthesis of cadmium-free quantum dots at Display Week 2018. The team led by Dr. André Geßner succeeded in producing unique multi-shell quantum dots based on indium phosphide. Integrated in QD-LED components, these cadmium-free quantum dots achieve a significantly higher luminance than cadmium-based systems. Also, indium phosphide-based QD-LEDs almost match the performance of conventional QD-LEDs in other parameters. The process of the application of OLEDs or QD-LEDs to the flexible substrate determines the flexibility of the finished display. Large layer thickness limits flexibility. Inkjet-printing has proven itself, but there are even better methods. For RGB AMOLED displays, Fraunhofer IAP and its partners are researching a new printing process for which they plan to achieve a minimum of 300 ppi in the intended demonstrator. With the electrostatic printing (ESJET), the scientists led by Dr. Christine Boeffel are investigating a printing process with which much finer and more uniform structures can be printed than with inkjet printing. ESJET printing is a new technology of processing ink by applying an electrical voltage. This allows for a much wider range of printable inks and even pastes. The drop-on-demand system so far achieves droplet sizes of less than 20 microns. “The size of 20 microns is already sufficient to print a display with 200 ppi. According to our knowledge, this is the highest resolution achieved by inkjet printing, yet. Our goal is to print a 300ppi RGB AMOLED display utilizing ESJET printing. We want to accomplish this with pixel sizes of 10 microns", explains Dr. Christine Boeffel. In her presentation, she will show the interim result of the ongoing research project Hi-Response. This project has received funding from the European Union‘s H2020-NMP-PILOTS-2014 programme under grant agreement No. 646296). The Fraunhofer IAP has been part of the German OLED Technology Alliance (GOTA) since 2017. Together with VON ARDENNE GmbH from Dresden, MBRAUN Inertgas-Systeme GmbH from Garching and Notion Systems GmbH from Schwetzingen, Fraunhofer IAP has bundled its expertise to develop and manufacture equipment and processes for applications for organic light-emitting diodes. May 22, 11.30 a.m. | Dr. Armin Wedel "From the Synthesis of High-Quality InP-based Quantum Dots to the Development of Efficient QD Light-Emitting Diodes"
May 24, 5.00 to 8.00 p.m. | Dr. André Geßner "Efficient InP-based Quantum Dot Light Emitting Diodes utilizing a Crosslinkable Hole Transport Layer"
May 25, 11.50 a.m. | Dr. Christine Boeffel: "Late-News Paper: High-Resolution Printing for Future Processing of RGB OLED Displays"